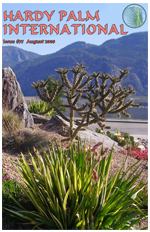 Past Issues of HPI - Contents and Links. This section deals only with the latest issues. Beyond that time frame, please refer to the HPI master list and contact Nick Parker for availability of a paper copy. Links mentioned in some of the articles can be accessed by clicking on the appropriate "more..." that follows the article description. Frank Hunaus was so impressed with Boyd Mason's garden at the summer barbecue that he returned the next week for a closer look. Nick files this report following his and Charlie's daytrip to Victoria in March. Michael Bostock brings the richness, diversity and beauty of figs to life in this excellent article on the preferred varieties and techniques for success in our climate. Nick makes his unscientific case for one of his favorite plants. 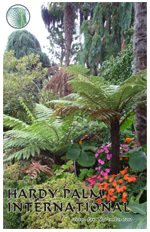 Edith assesses member's views on winter protection for tree ferns. A brief profile on this issue's back cover. Nick chronicles the Vancouver Park Board's decision to close one of the city's favorite botanical attractions. 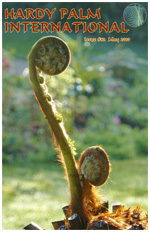 Michael Bostock and John Brimacombe report on their efforts to grow three species of Cyathea treeferns. 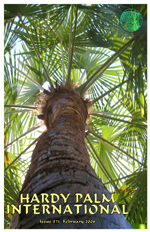 Rob Larkin reports on the remarkable effort and success being achieved by several palmophiles in his state growing palms outdoors. 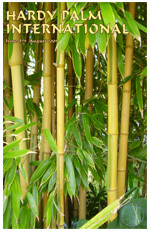 Charlie Warburton makes the case for including more potted palms in your garden. Nick reports on the surprising hardiness in his garden of this seldom discussed family of plants. The final part of Ian Barclay's review of promising Grevillia species. With this new feature Edith Camm, the club's mentorship coodrinator, selects an interesting question from a Society member seeking plant or garden advice. The summer of 2009 included some of the warmest days ever in parts of the Pacific Northwest. 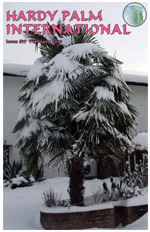 With winter approaching Jeff St Gelais discusses his winter protection techniques and some of the palms growing in his beautiful Victoria garden. 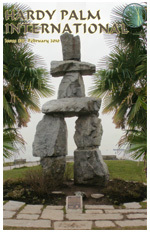 Campbell River BC is home to Kevin Thomson and his primordial pick of prehistoric plants. 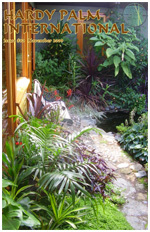 Nick spends an afternoon exploring George Bogess' subtropical woodland retreat. Nick takes a look at government intransigence and how it has affected Ray Mattei's home and garden in sunny Beach Grove. Potential Candidate for the PNW? Nick Bettner’s change of address notice arrived with an explanation and photos! What’s Wrong With My Palm? How Hardy the Hebe ? 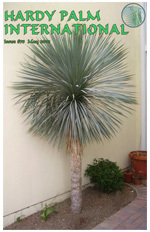 When is a Palm not a Palm ? New! - Links mentioned in some of the articles can be accessed by clicking on the appropriate "more..." that follows the article description. Frank Hunaus, the Society Treasurer, finds a children’s fairytale a useful analogy in urging club members to get more involved. More...Click here for a pdf list of towns mentioned in the article. Seed collecting in the French way. More...Link to "Le Forum des Fous de Palmiers". Nick Parker reports on the Society’s visit last July to two of Seattle’s more exotic locations - one fauna and one flora. 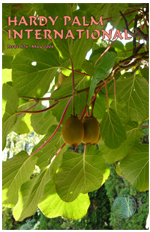 Nick joined other Society members for a very successful visit last August to member gardens in Delta and Tsawwassen. 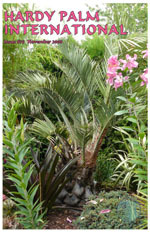 Jeff St Gelais describes his efforts to save a Butia capitata, severely damaged by winter cold. Reminiscences of "South of the Fraser"
Excellent summer photos find a home on these pages. Banana Joe Clemente returns with his notes from Canada’s most exotics-friendly island. 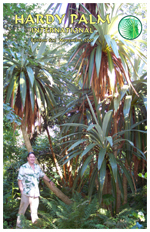 Nick finds a Phoenix canariensis that has survived against all odds.